Send beautiful lilies in a vase or a hand bouquet to show how much you care. Lily is one of the most beautiful flowers in the world. And it is a favorite for everyone to arrange a lovely bouquet. Arrange lilies in a vase can last many days. Lilies also have a good smell. 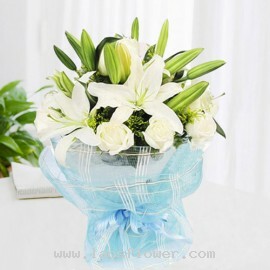 We offer many kind of lilies to satisfy every occasion. 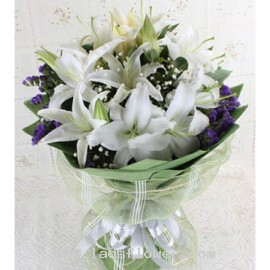 Such as calla lilies, casablanca lilies, oriental lilies, and stargazer lilies. 8 Pink Lilies Bouquet accents with white gypsophila flowers, purple statice flowers, caspia flowers, red hypericum, and green leaves. Wrapped with plastic and red paper and tied with pink ribbon. Each lilly will have about three flower buds and blooming flowers. * In.. Pink Flower Vase consists of 6 pink roses, 5 pink lilies accents with white gypsophila and green on the side. Arranged in a clear glass vase. We can add a bow if you want. 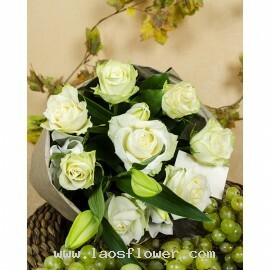 * The color of the flowers can be changed by informing our staff or by email with order number. * In case that we don't h.. 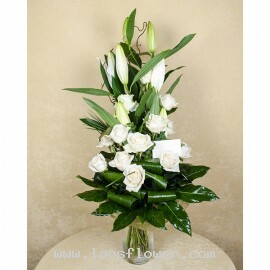 Pink Roses & White Lilies Bouquet consists of 10 pink roses and 8 white lilies accents with greens. Wrapped with white, purple and pink paper, then tie with a straw of natural color. This bouquet is perfect for graduation. Occasionally, substitutions may be necessary to create your bouquet du..
Red Flower Basket arranged to show 1 side consists of 24 red roses, 6 pink lilies, white cutter flower and ferns and tied with red ribbon on the basket. This basket is ideal for congratulations on any occasion such as birthdays, business openings, company launches new products, housewarming, promote..
White Lilies & White Roses bouquet consists of 5 lilies and 12 roses arranged in a vase and accents with greens. We can also arrange this as a hand bouquet. Occasionally, substitutions may be necessary to create your bouquet due to the availability of certain flowers in various parts of ..
White Lilies Bouquet - A bouquet 10 white lilies accents with white gypsophila and purple statice flowers on the side. A bouquet wrapped in green paper and green mesh and tied with a white bow. Occasionally, substitutions may be necessary to create your bouquet due to the availability of certain ..